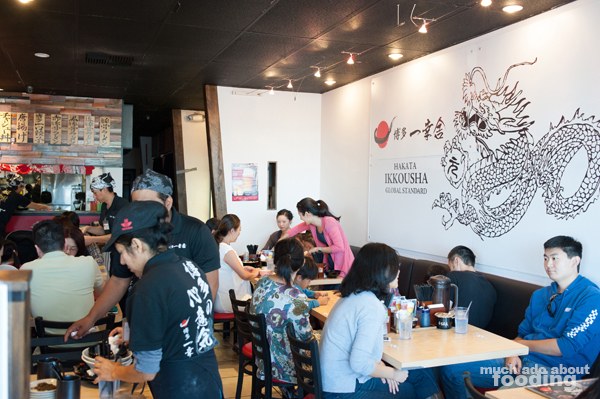 The noodles, the broth, the ambiance - Hakata Ikkousha in Costa Mesa boils it down to a pure love of ramen. If you just about worship the dish, you might want to wander on down to this spot in the burgeoning plaza because it is superb for tonkotsu lovers. 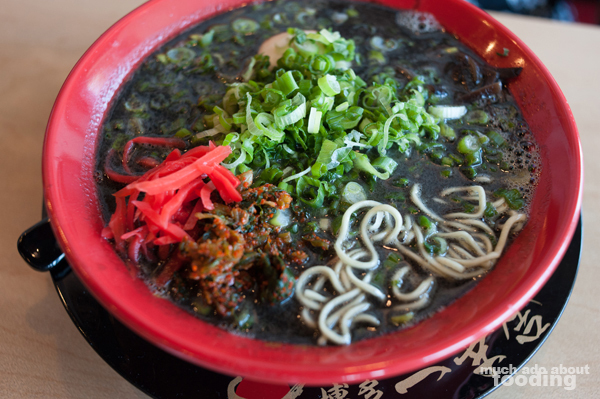 In fact, it has turned into our favorite ramen spot in Orange County, supplanting the beloved SSG and Santouka eateries that grace the top lists of many. 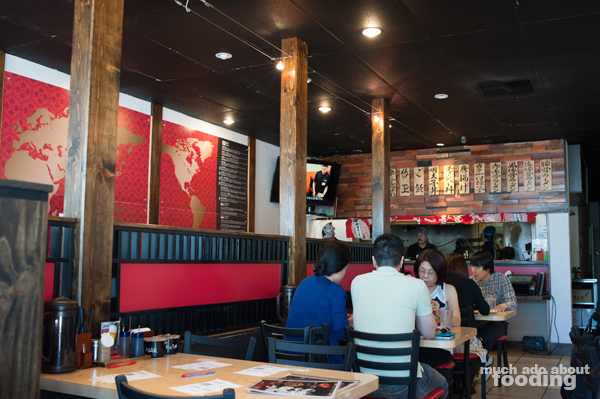 When we first visited Hakata Ikkousha, we were struck by how the walls told the restaurant's story (derived from other locations in the world) but also how the monitors shared the journey. There is usually a wait but the service is quick and the staff ready to serve the moment you finally get to sit down. Options are simply displayed in a menu that features a small number of broth types (a good sign - they are focused!) and accompanying dishes. While many have spoken highly of their God Fire Ramen choices, we are wimps and opt for something less burning each time. Also, though the portions are substantial enough for our appetites, we often order at least one appetizer because despite the few choices they offer here, each is delightful. We normally choose the Hakata Specialty Hitokuchi Gyoza ($3.50 for 5/$6.00 for 10 - Ikkousha-style pan-fried dumplings) which comes with a pleasantly tangy and spicy dipping sauce but on this occasion, we needed to capitalize on the solid crunch of their Special Fried Chicken ($3 for 1/$7 for 3 - marinated with Ikkousha sauce on deep-fried chicken). 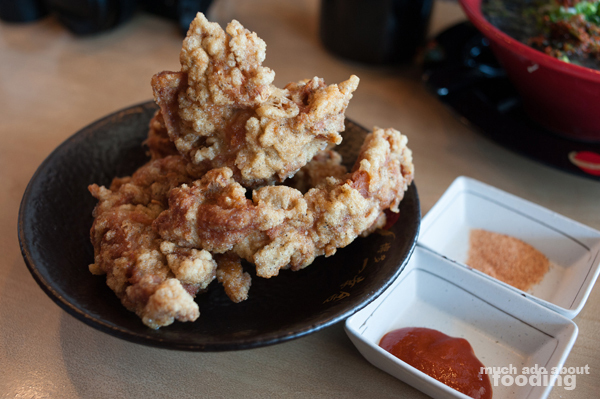 It is perfectly juicy and tender inside despite its loud, crisp exterior (so satisfying! ), and the pieces themselves are adequately sized to share or feed a hungry person. 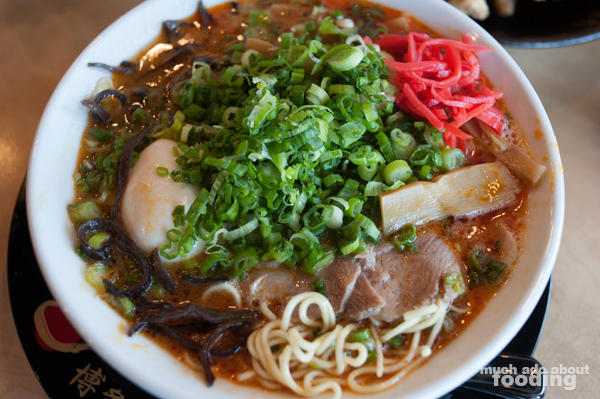 The stars at Hakata Ikkousha, however, show up as delectable, downright scrumptious bowls of ramen. You could start off with the Tonkotsu Standard ($7.90 - signature tonkotsu broth, thin straight noodles, housemade chashu, wood ear mushrooms, and green onions) to get a feel for the place but if you seek a heavier, heartier meal, you might want to snag my go-to, the Tonkotsu Black ($8.90 - garlic tonkotsu broth, thin straight noodles, housemade chashu, wood ear mushrooms, and green onions). Add on some bamboo shoots ($1) and egg ($1.50) for more oomph, and you've got yourself a stellar meal. 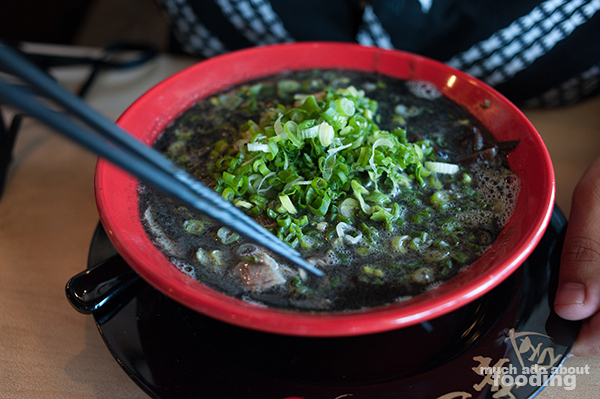 The black garlic tonkotsu broth is presented steaming hot, practically hiding all of the other components underneath the thickness. It is rich and savory, wholesome and sultry in your mouth. With every sip, it is obvious that much time was dedicated to making it. You would say the same about their Tonkotsu Mentaiko ($8.90 - tonkotsu broth with mentaiko flavor, straight noodles, housemade chashu, wood ear mushrooms, and green onions) as well which has limited quantities daily. This one was certainly less heavy but the mentaiko flavor really brought out other elements of the broth not experienced in the other; the fish accent highlighted the broth's saltiness to an appreciative amount, and be assured that we slurped this up without hesitation. If by now, you need to get your hands on a bowl, find Hakata Ikkousha at 3033 Bristol St, Costa Mesa, CA 92626 and get there early. We've been several times and the shortest waits are when we arrive just after opening. Trust me - you'll enjoy it.